The history of Sikhism is closely associated with the history of Punjab and the socio-political situation in medieval India. Sikh distinction was further enhanced by the establishment of the Khalsa (ਖ਼ਾਲਸਾ), by Guru Gobind Singh in 1699. Sikhism was created by Guru Nanak Dev, a religious leader and a social reformer during the fifteenth century in the Punjab region. The religious practice was formalized by Guru Gobind Singh on March 30, 1699. The latter baptised five persons from different social backgrounds to form Khalsa. The first five, Pure Ones, then baptized Gobind Singh into the Khalsa fold. 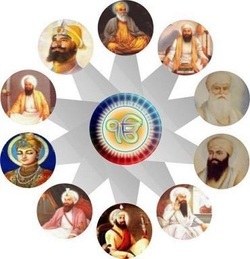 This gives the Khalsa, as an organized grouping, a religious history of around 400 years. Generally Sikhism has had amicable relations with other religions. However, during the Mughal rule of India (1556–1707), emerging religion had strained relation with the ruling Mughals. Prominent Sikh Gurus were martyred by Mughals for opposing some Mughal emperors' persecution of minority religious communities. Subsequently, Sikhism militarized to oppose Mughal hegemony. The emergence of the Sikh Confederacy under the misls and Sikh Empire under reign of the Maharajah Ranjit Singh was characterized by religious tolerance and pluralism with Christians, Muslims and Hindus in positions of power. The establishment of the Sikh Empire is commonly considered the zenith of Sikhism at political level, during this time the Sikh Empire came to include Kashmir, Ladakh, and Peshawar. Hari Singh Nalwa, the Commander-in-chief of the Sikh army along the North West Frontier, took the boundary of the Sikh Empire to the very mouth of the Khyber Pass. The Empire's secular administration integrated innovative military, economic and governmental reforms. Guru Nanak Dev (1469–1538), founder of Sikhism, was born to Kalu Mehta and Mata Tripta, wherein the Bedi Khatri clan of a Hindu family in the village of Talwandi, now called Nankana Sahib, near Lahore. His father, a Hindu named Mehta Kalu, was a Patwari, an accountant of land revenue in the government. Nanak's mother was Mata Tripta, and he had one older sister, Bibi Nanki. From an early age Guru Nanak seemed to have acquired a questioning and enquiring mind and refused as a child to wear the ritualistic "sacred" thread called a Janeu and instead said that he would wear the true name of God in his heart as protection, as the thread which could be broken, be soiled, burnt or lost could not offer any security at all. From early childhood, Bibi Nanki saw in her brother the Light of God but she did not reveal this secret to anyone. She is known as the first disciple of Guru Nanak. Even as a boy, Nanak was fascinated by religion, and his desire to explore the mysteries of life eventually led him to leave home. 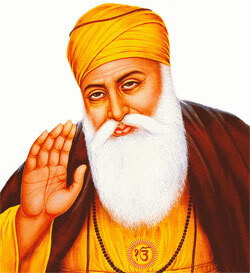 It was during this period that Nanak was said to have met Kabir (1440–1518), a saint revered by many. Nanak married Sulakhni, daughter of Moolchand Chona, a trader from Batala, and they had two sons, Sri Chand and Lakshmi Das. Guru Nanak spent the final years of his life in Kartarpur where Langar (free blessed food) was available. The food would be partaken of by Hindus, rich, poor, high or/and so called low castes. Guru Nanak worked in the fields and earned his livelihood. After appointing Bhai Lehna as the new Sikh Guru, on 22 September 1539, aged 70, Guru Nanak met with his demise. In 1538, Guru Nanak chose Lehna, his disciple, as a successor to the Guruship rather than one of his sons. 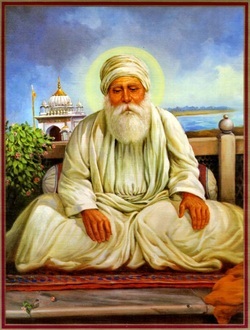 Bhai Lehna was named Guru Angad and became the successor of Guru Nanak. Bhai Lehna was born in the village of Harike in Ferozepur district in Punjab, on March 31, 1504. He was the son of a small trader named Pheru. His mother's name was Mata Ramo (also known as Mata Sabhirai, Mansa Devi, Daya Kaur). Baba Narayan Das Trehan was his grand father, whose ancestral house was at Matte-di-Sarai near Mukatsar. Under the influence of his mother, Bhai Lehna began to worship Durga (A Hindu Goddess). He used to lead a group of Hindu worshippers to Jawalamukhi Temple every year. He married Mata Khivi in January 1520 and had two sons, (Dasu and Datu), and two daughters (Amro and Anokhi). The whole Pheru family had to leave their ancestral village because of the ransacking by the Mughal and Baloch military who had come with Emperor Babur. After this the family settled at the village of Khadur Sahib by the River Beas, near Tarn Taran Sahib, a small town about 25 km. from Amritsar city. His devotion and service (Sewa) to Guru Nanak and his holy mission was so great that he was instated as the Second Nanak on September 7, 1539 by Guru Nanak. Earlier Guru Nanak tested him in various ways and found an embodiment of obedience and service in him. He spent six or seven years in the service of Guru Nanak at Kartarpur. After the death of Guru Nanak on September 22, 1539, Guru Angad left Kartarpur for the village of Khadur Sahib (near Goindwal Sahib). He carried forward the principles of Guru Nanak both in letter and spirit. Yogis and Saints of different sects visited him and held detailed discussions about Sikhism with him. Guru Angad introduced a new alphabet known as Gurmukhi Script, modifying the old Punjabi script's characters. Soon, this script became very popular and started to be used by the people in general. He took great interest in the education of children by opening many schools for their instruction and thus increased the number of literate people. For the youth he started the tradition of Mall Akhara, where physical as well as spiritual exercises were held. He collected the facts about Guru Nanak's life from Bhai Bala and wrote the first biography of Guru Nanak. 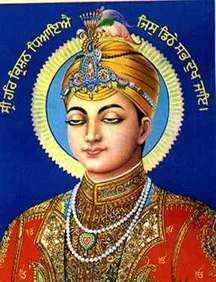 He also wrote 63 Saloks (stanzas), which are included in the Guru Granth Sahib. He popularised and expanded the institution of Guru ka Langar that had been started by Guru Nanak. Guru Angad travelled widely and visited all important religious places and centres established by Guru Nanak for the preaching of Sikhism. He also established hundreds of new Centres of Sikhism (Sikh religious Institutions) and thus strengthened the base of Sikhism. The period of his Guruship was the most crucial one. The Sikh community had moved from having a founder to a succession of Gurus and the infrastructure of Sikh society was strengthened and crystallized – from being an infant, Sikhism had moved to being a young child and ready to face the dangers that were around. During this phase, Sikhism established its own separate spiritual path. Guru Angad, following the example set by Guru Nanak, nominated Sri Amar Das as his successor (the Third Nanak) before his death. He presented all the holy scripts, including those he received from Guru Nanak, to Guru Amar Das. He breathed his last on March 29, 1552 at the age of forty-eight. It is said that he started to build a new town, at Goindwal near Khadur Sahib and Guru Amar Das Sahib was appointed to supervise its construction. It is also said that Humayun, when defeated by Sher Shah Suri, came to obtain the blessings of Guru Angad in regaining the throne of Delhi. In 1635, upon meeting Guru Angad, Bhai Sahib was so touched by the Guru's message that he became a devout Sikh. Soon he became involved in Sewa (Service) to the Guru and the Community. Under the impact of Guru Angad and the teachings of the Gurus, Bhai Amar Das became a devout Sikh. He adopted Guru as his spiritual guide (Guru). Bhai Sahib began to live at Khadur Sahib, where he used to rise early in the morning and bring water from the Beas River for the Guru's bath; he would wash the Guru's clothes and fetch wood from the jungle for 'Guru ka Langar'. He was so dedicated to Sewa and the Guru and had completely extinguished pride and was totally lost in this commitment that he was considered an old man who had no interest in life; he was dubbed Amru, and generally forsaken. “ He who calls himself a Sikh of the True Guru, He must get up in the morning and say his prayers. He must rise in the early hours and bathe in the holy tank. He must meditate on God as advised by the Guru. And rid him of the afflictions of sins and evil. As the day dawns, he should recite scriptures, and repeat God's name in every activity. He to whom the Guru takes kindly is shown the path. Nanak! I seek the dust of the feet of the Guru's Sikh who himself remembers God and makes others remember Him. (Gauri) ” Guru Ji strengthened the tradition of 'Guru ka Langar' and made it compulsory for the visitor to the Guru to eat first, saying that 'Pehle Pangat Phir Sangat' (first visit the Langar then go to the Guru). Once the emperor Akbar came to see Guru Sahib and he had to eat the coarse rice in the Langar before he could have an interview with Guru Sahib. He was so much impressed with this system that he expressed his desire to grant some royal property for 'Guru ka Langar', but Guru Sahib declined it with respect. He introduced new birth, marriage and death ceremonies. Thus he raised the status of women and protected the rights of female infants who were killed without question as they were deemed to have no status. These teachings met with stiff resistance from the Orthodox Hindus. He fixed three Gurpurbs for Sikh celebrations: Diwali, Vaisakhi and Maghi. Guru Amar Das not only preached the equality of people irrespective of their caste but he also fostered the idea of women's equality. He preaching strongly against the practice of Sati (a Hindu wife burning on her husband's funeral pyre). Guru Amar Das also disapproved of a young widow remaining unmarried for the rest of her life. When it came time for the Guru's younger daughter Bibi Bhani to marry, he selected a pious and diligent young follower of his called Jetha from Lahore. Jetha had come to visit the Guru with a party of pilgrims from Lahore and had become so enchanted by the Guru's teachings that he had decided to settle in Goindwal. Here he earned a living selling wheat and would regularly attend the services of Guru Amar Das in his spare time. Guru Ram Das (Punjabi: ਗੁਰੂ ਰਾਮ ਦਾਸ) (Born in Lahore, Punjab, Pakistan on 24 September 1534 – 1 September 1581, Amritsar, Punjab, India) was the fourth of the Ten Gurus of Sikhism, and he became Guru on 30 August 1574, following in the footsteps of Guru Amar Das. He was born in Lahore to a Sodhi family of the Khatri clan. His father was Hari Das and mother Anup Devi, and his name was Jetha, meaning 'first born'. His wife was Bibi Bhani, the younger daughter of Guru Amar Das, the third guru of the Sikhs. They had three sons: Prithi Chand, Mahadev and Arjan Dev. As a Guru one of his main contributions to Sikhism was organizing the structure of Sikh society. Additionally, he was the author of Laava, the hymns of the Marriage Rites, the designer of the Harmandir Sahib, and the planner and creator of the township of Ramdaspur (later Amritsar). A hymn by Guru Ram Das from page 305 of the Guru Granth Sahib: "One who calls himself a Sikh of the True Guru shall get up early morning and meditate on the Lord's Name. Make effort regularly to cleanse, bathe and dip in the ambrosial pool. Upon Guru's instructions, chant Har, Har singing which, all misdeeds, sins and pains shall go away." 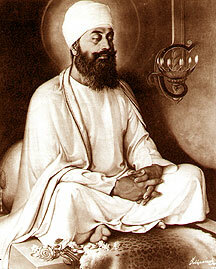 Guru Ram Das nominated Guru Arjan Dev, his youngest son, as the next Guru of the Sikhs. Guru Arjan Dev Ji (Punjabi: ਸ੍ਰੀ ਗੁਰੂ ਅਰਜੁਨ ਦੇਵ ਜੀ, IPA: [gʊru əɾdʒən dev]) (15 April 1563 – 30 May 1606) was the fifth of the Ten Gurus of Sikhism. He was born in Goindval, Punjab, India, the youngest son of Guru Ram Das and Bibi Bhani, the daughter of Guru Amar Das. 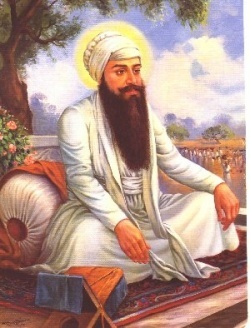 He became the Guru of the Sikhs on 1 September 1581 after the death of his father Guru Ram Das. Guru Arjan died in Lahore, Punjab, (now in Pakistan). 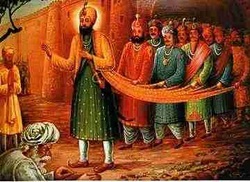 Before his death, he nominated his son Har Gobind as the next Guru of the Sikhs. 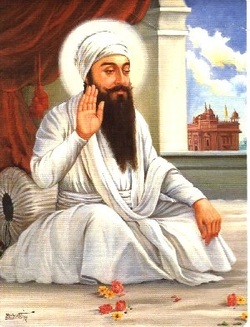 Guru Arjan was head of Sikhism for a quarter of a century and accomplished a lot during his regime. He completed the construction of Amritsar and founded other cities such as Taran Taran and Kartarpur. He constructed a Baoli at Lahore. The most important work of Guru Arjan was the compilation of Adi Granth. He collected all the work of the first four Gurus and dictated it in the form of verses in 1604. It is, perhaps, the only script which still exists in the form first published (a hand-written manuscript) by the Guru. It and the Guru Granth Sahib which includes the writing of the later Gurus have managed to avoid the embellishments, additions and alterations that have plagued the original writing of other more ancient religious texts. 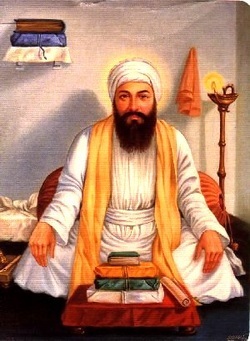 Guru Arjan organised the Masand system, a group of representatives who taught and spread the teachings of the Gurus and also collected the Dasvand, one-tenth of a Sikh's income (in money, goods or service) that Sikhs paid to support the building of Gurdwara Sahib, the all important Guru ka Langars (free communal kitchens) originally intended to share with sense of love, respect and equality, still an important element today in any Gurdwara. The Langars were open to any visitors and were designed from the start to stress the idea of equality and a casteless society. The land that Amritsar is built upon is believed to be a jagir (estates gifted to individuals under the Mughal system which included one or more villages and often a portion of the crops produced on the land) given as a gift by the Emperor Akbar, who was impressed by the practice, after sharing a meal in the Guru's communal kitchen, seated on the floor among commoners. 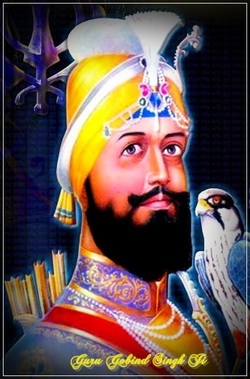 Guru Hargobind Sahib, (Punjabi: ਗੁਰੂ ਹਰਿ ਗੋਬਿੰਦ ਸਾਹਿਬ, IPA: [gʊru həɾgobɪnd sɑhɪb]) also Saccha Badshah (ਸੱਚਾ ਪਾਦਸ਼ਾਹ True King) (19 June 1595–2 March 1644) was the sixth of the Ten Gurus of Sikhism and became Guru on 25 May 1606 following in the footsteps of his father Guru Arjan Dev. He was the sixth Guru in Sikhism. He was not, perhaps, more than eleven at his father's execution. 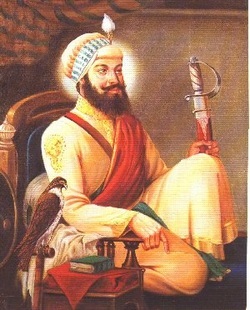 Before ascension, he nominated Guru Har Rai, his grandson as the next Guru of the Sikhs. From the very beginning he was the deadly enemy of Mughals. Guru Gobind Singh Ji (Punjabi: ਗੁਰੂ ਗੋਬਿੰਦ ਸਿੰਘ, IPA: [gʊɾu gobɪnd sɪ́ŋg]); 22 December 1666 – 7 October 1708) was the tenth Guru of Sikhism. He was born in Sikh Hunjan near Patna, Bihar in India and became a Guru on 11 November 1675, at the age of nine years, succeeding his father Guru Tegh Bahadur. He was the leader of the Sikh faith, a warrior, a poet and a philosopher. In Sikh society, Guru Gobind Singh is considered an epitome of chivalry; scholar, skilled in horsemanship, armed combat, chivalrous, and generous in character. Guru Gobind Singh's life and teachings have had a lasting impression on Sikh ideology as well as in their daily life. His establishment of the Khalsa in 1699 is considered as one of the most important events in history of Sikhism. He fought several defensive battles with the Mughals and their alliances, such as Rajas of Shivalik Hills. Guru Gobind Singh was the last human Sikh Guru; and in Nanded he declared the Guru Granth Sahib, the holy scripture of Sikhism, as the final Sikh Guru on October 7, 1708.